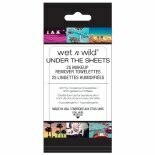 Cover scars and protect them while they heal with scar removal sheets. These scar sheets can help diminish the appearance of scars by softening and flattening the skin. 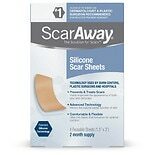 Scar removal sheets come in various shapes and sizes. 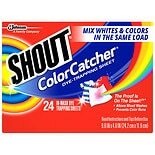 You can try rectangular sheets that can be cut to the size and shape you need. There are also scar reduction treatments that are specifically for the breast or stomach to treat scars from mastectomies or c-sections or other surgeries. 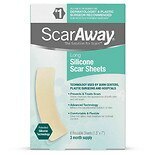 Top brands like Retouch and ScarAway offer easy-to-use silicone scar sheets to help you accelerate healing. 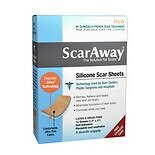 Scar removal sheets can be used for new or old scars and are washable and reusable. 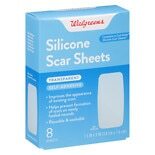 Silicone scar sheets are pliable and can conform to your body for a comfortable fit. These scar treatments hydrate your skin to soften it and act as a natural barrier. Most silicone scar reduction sheets can be worn under clothing or compression garments safely. Besides scar management products, we also carry a wide selection of post-surgical products to aid in recovery. Choose your doctor-recommended wound dressing from the variety of types available. Among our mastectomy care products are breast prosthesis in various sizes and styles as well as post-mastectomy bras. There are also basic first aid products including bandages, alcohol and swabs, and antiseptics and topical antibiotics to help with minor injuries.